The daily Bar Chart Pattern of S&P 500 crossed above its 50 day EMA and touched a high of 1963 on Feb 26 '16, but formed a small 'reversal day' pattern that can end the rally from the Feb 11 low of 1810. By moving above the Feb 1 top of 1947, the index has met the first technical condition of a 'double bottom' reversal pattern. However, falling volumes raises questions about the sustainability of the rally from the low of Feb 11. Daily Technical Indicators are looking bullish. 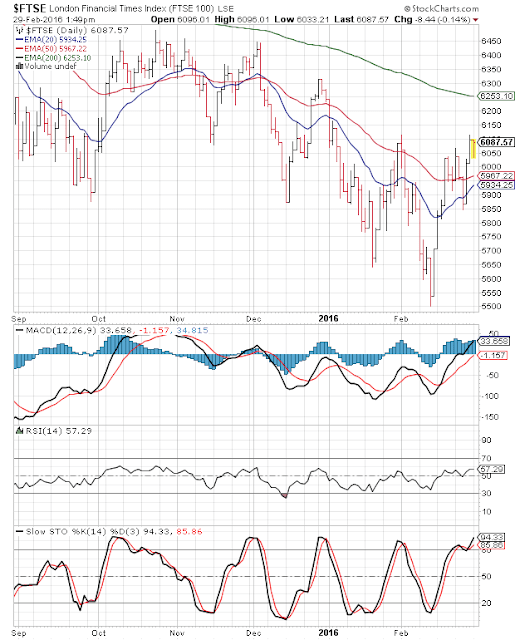 MACD is rising above its signal line and Entered Positive Zone. RSI is above its 50% level, but moving sideways and not showing much upward momentum. Slow stochastic is well inside its overbought zone. 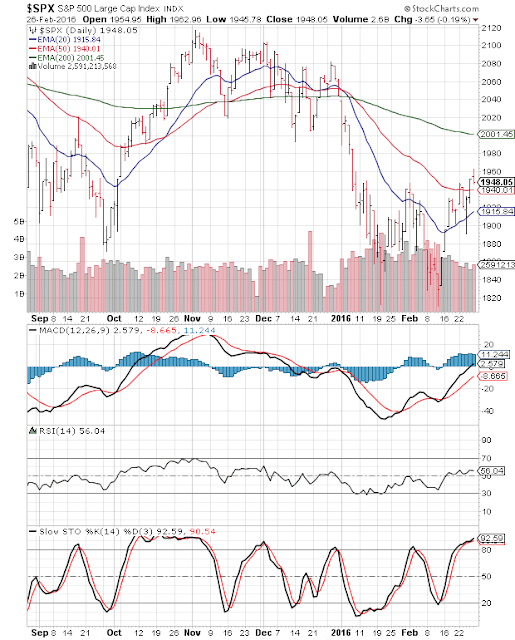 The index gained 1.6% on a Weekly Closing Basis, but is trading below its sliding 200 day EMA in bear territory. Expect sellers to come to the fore soon. On longer Term Weekly Chart (not shown), the index closed 130 points above its 200 week EMA, but below its falling 20 week and 50 week EMAs for the 8th week in a row. The long-term bull market is still intact. Weekly Technical Indicators are in bearish zones and showing some upward momentum. The Daily Bar Chart pattern of FTSE 100 shows a spirited fight back by bulls. After dropping below its 20 day and 50 day EMAs on Wed. Feb 24 '16, the index bounced up to test its Feb 1 top of 6115 on Fri. Feb 26. By closing at 6096, the index gained nearly 2.5% on a weekly closing basis. It was the highest close since Jan 5 '16. The index also broke out above the downward channel within which it was trading for the past 4 months. Bulls may have exhausted all their ammunition during the rally from the Feb 11 low of 5499.50. At the time of writing this post, the index has been in corrective mode. Daily technical indicators are looking bullish. MACD is above its signal line and has entered positive zone. RSI is above its 50% level, but its upward momentum has stalled. Slow stochastic is looking overbought. The index is trading more than 150 points below its falling 200 day EMA in a bear market. Bears are likely to attack at any time. On Longer Term Weekly chart (not shown), the index is trying to overcome resistance from its 20 week EMA and is trading well below its 50 week and 200 week EMAs. The 50 week EMA has crossed below the 200 week EMA - the 'death cross' technically confirming a long-term bear market. Weekly technical indicators are showing some upward momentum, but MACD and RSI are still in bearish zones.